With Search built right into the keyboard, users have a faster, easier experience browsing the web. Microsoft has rolled out a new feature on its SwiftKey keyboard which will let users Wshare anything from the keyboard itself. 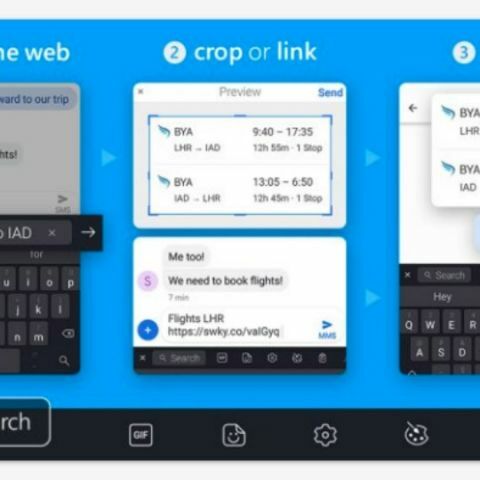 With Search built right into the keyboard, users have a faster, easier experience browsing the web. Today, we’re unveiling a new feature on SwiftKey for Android that makes it easy and quick to share anything you want from the web. With search built right into the keyboard, you have a faster, easier experience browsing the web. In just a few taps, you have access to search results that you can then easily screenshot, crop and share with your friends. Whether it’s the whole webpage, just one picture or a snippet of text, this feature makes it easy to share exactly what you want. To use, simply open the Toolbar by tapping the “+” on the top left, select the search icon and type what you’re looking for into the box right there in the Toolbar. If you type a search term, you’ll have instant access to rich search content from Bing; if you type in a URL, you’ll be taken to that webpage. Search is the latest feature to be added to the Toolbar, which gives you quick and easy access to all the different ways you can customize SwiftKey. Add Stickers to your messages, share your Calendar or Location details, translate in over 60 languages and now, share anything from the web. go for Mini Bluetooth Keyboard it is best for you. How to share Internet connection from my laptop to mobile?